The PacScan Plus 300AP+ offers a portable, digital, combination A-scan and pachymeter, with a large color touch screen, on-board memory and USB interface for EMR archiving, extreme accuracy, repeatable measurements and reliability. The combination of a high frequency, low noise probe and fast precise algorithm enables scan capture immediately upon application of the probe along the visual axis. The PascScan Plus A-scan offers built-in immersion capabilities and up to nine IOL formulas, including three post-refractive formulas. Axial length, ACD, and lens thickness are provided for each scan. Group up to five scans with average axial length and standard deviation automatically calculated. Easily review each scan, delete outlying scans, and add new scans, as desired. Customizable tissue velocities of each structure and highly-developed automatic scan recognition algorithms ensure accurate and repeatable measures. Built-in calibration check ensures continued accuracy of system. The PacScan pahymeter measurement accuracy and repeatability are assured by each scan actually consisting of 64 individual measurements and an automatic measurement algorithm to ensure that only scans with proper probe alignment are accepted, even on the periphery. The high 20 MHz probe frequency and processing algorithms enable measures as thin as 125 microns, for measuring corneal flap or bed, and multiple corneal maps are available. Also comes standard with central corneal thickness correction calculator for measured applanation IOP. The PacScan Plus 300+ series offers extreme portability, with built-in printer and probe storage compartment, all in a compact and lightweight package. Printer allows for hardcopy record of scans, IOL calculations, and corneal maps. Data download and scan viewer software option also available to create permanent digital archive of scan results. Two probe styles are available for both A-scan and pachymetry, depending upon user preference and scanning application. Built-in immersion scanning capabilities is provided with optional Prager shell for ease of use and the highest assurance of accuracy and repeatability. 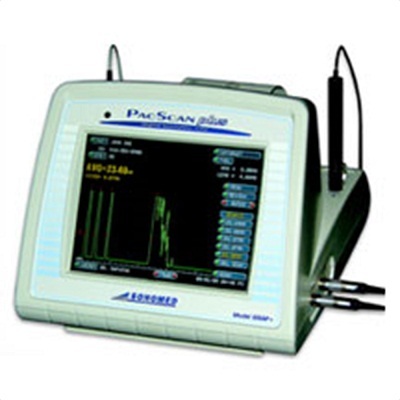 Click the button below to add the Sonomed PacScan Plus Pachymeter to your wish list.